Distribution: ochs und junior watches are exclusively purchasable directly from the ochs und junior workshop in Lucerne (in person or shipped worldwide via FedEx). Owners: Ludwig/Kornelia Oechslin and Beat Weinmann (majority share), Ulysse Nardin (minority share). Board of directors: Ludwig Oechslin (chairman), Beat Weinmann (CEO), Patrick Pruniaux (CEO Ulysse Nardin), Lucas Humair (Industrial Director for Ulysse Nardin), Kornelia Oechslin (Professor of Modern and Contemporary Art and Architecture at the University of Lausanne). Employees: (6). Ludwig Oechslin is responsible for all technical development and design. Beat Weinmann serves as CEO. Watchmakers Sandra Flück and watchmaker Kevin Hoffmann assemble, regulate and repair ochs und junior watches at the ochs und junior workshop in Lucerne. Cail Pearce is responsible for communication and Isabelle Ruckstuhl is responsible for administration. Ludwig Oechslin: Oechslin’s C.V. (PDF) covers his watchmaking projects for Ulysse Nardin (the Freak, Moonstruck, Trilogy of Time, Perpetual GMT, and Sonata), as well as his academic studies (doctorate in Theoretical Physics from the University of Bern). 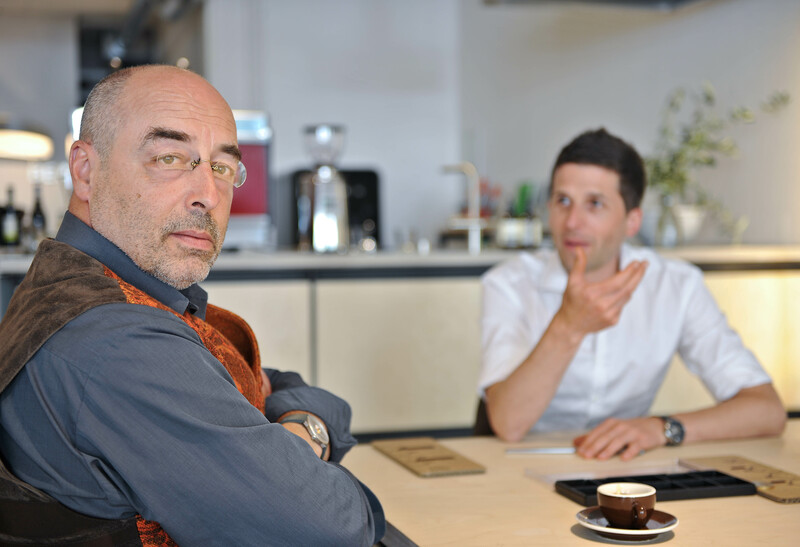 Oechslin was director of the Musée International d’Horlogerie (MIH) in La Chaux-de-Fonds, Switzerland from 2001-2014. Concept: Rigorously simple watches by Ludwig Oechslin. Unique point 1: Ludwig Oechslin creates ochs und junior watches for his own pleasure. They are not designed to meet the needs of the market. Unique point 2: ochs und junior watches use gear systems to implement functions (example: annual calendar). Their turning wheels support Oechslin’s goal of displaying time horizons in analog fashion. Traditional mechanical watches implement functions using levers and springs (and far more parts). Unique point 3: Oechslin’s date spiral (example: date) is designed to make the time the first information in the watch’s visual heirarchy, and to make the date readable from the same distance as the time. Unique point 4: Patination and milling for dial contrast (Oechslin’s use of patination at ochs und junior). Unique point 5: Visibly machined cases, crowns and buckles that do not obscure the raw materials they use (more info). Unique point 6: No logo and no descriptive text on the dial or the case. Open-ended customization: The size, materials and colors for each ochs und junior watch can be fully customized. This is called “open-ended” customization, because the customer is not choosing from pre-defined options, but designing their watch in collaboration with cofounder Beat Weinmann (more info). Current models: Ludwig Oechslin’s two time zones + date watch displays two time zones and the date in a functional, yet at the same time romantic, way. The day/night by Oechslin is a unique astronomical watch which shows the length of the day, sunrise, sunset and more. Oechslin’s perpetual calendar watch is executed in just 9 additional parts, and the date can be adjusted forwards and backwards. His moon phase watch provides 3’478.27 years of precision in 5 parts, while his annual calendar watch offers analog display of the month, date and weekday in 3 additional parts. Oechslin’s date watch has just the essentials, and his two time zones watch displays two time stories on one hand. Earlier models: anno cinquanta, settimana junior.